HP and Intel are building a multifaceted storage product portfolio with a common foundation that will enable the integration of server and storage into Converged Systems. The most desirable storage solution technologies are represented include virtualization, data deduplication, automated tiering, multi-protocol I/O, and performance at scale. HP has one a step further toward delivering value in an easily upgradeable software by building storage based on standard, modular, scale-out, and clustered architures. 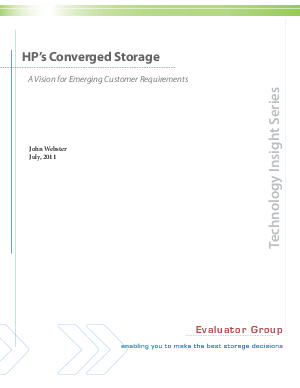 The result is HP Converged Storage - a convergence of advanced HP Infrastructure powered by Intel® Xeon® processors, software, and management technologies gathered together within a cohort storage product portfolio that will offer your business performance and agility.